Who to hire – a freelancer, an agency or an employee? When it comes to planning a new project, the biggest hurdle to overcome is hiring the right people to do the work. What you’re hoping and praying for is that the person who tells you they understand your vision and can deliver what you want, can actually do what they say. All too often a project fails to live up to your expectations or the project has overwhelmed those tasked with building it. Ultimately, it’s the quality of the finished article that suffers. A sad fact exists, some developers simply aren’t very good and thus, the code quality is quite low or corners are cut. As a result, what’s delivered is unstable and bug ridden which very quickly starts to hinder the day to day running of the site. It’s my hope that the following analysis of the options faced when deciding who to hire for a project sheds some lights on the bonuses and potential pitfalls facing you. One of the most important things to remember when looking for a contractor (as that is what all the options essentially are) is to take your time and don’t rush the decision. If you feel forced you need to hire someone now, then you may miss some key signals that could alter your decision on who to hire. So…on to the different options on who to hire. Let’s start with this question – what is a freelancer? How does a freelancer differ to the other options? In simple terms, a freelancer is a one man agency. A freelancer will handle everything from initial meet right through to developing and managing every aspect of the project. What immediately jumps out from that statement is that a freelancer has to wear many different hats through the process. That one freelancer is not just a web developer but also a sales person, accountant, account manager, project manager, marketing executive, web designer, search engine optimisation consultant. The list continues to grow and goes on to become an extensive array of different roles and skills. The old adage of Jack of all trades, master of none may seem to ring true here but this can in fact be advantageous and suit how you work yourself. Here’s why. That freelancer isn’t going to charge you for every single aspect of the project and while they have an hourly rate, it’s all inclusive. As an example, a freelancer will look at what they want to earn per week and then multiple how many weeks your project will take by that weekly earnings target. Leading on from that, a freelancer is going to be working from home or, at most, a shared office space which in turn results in zero to very low fixed costs per month outside of the hours being put in to the project. The freelancer’s hourly rate doesn’t need to factor in profit margins, commercial rent, buildings insurance, pension plans for employees, corporation tax and so on. It’s a 1:1 ratio between what the freelancer spends each month and what the freelancer wants to earn. As soon as you work with someone who has staff, you’re paying for a whole lot more than just that one developer’s time being spent in front of the keyboard. To sum up, all things being equal, freelancers are the cheapest option from an outright monetary perspective. In terms of working relationship, working with a freelancer can be a lot more personal. While the project is in progress, a freelancer is for all intents and purposes, an employee of you, the client. You expect your freelancer to turn up to work and complete a day’s worth of work to the specification set out in the project scope and to a standard that is expected of your employees. This can also be a massive pitfall but more on that later. At the end of the day, it’s very much a one-on-one relationship between client and freelancer. A freelancer isn’t likely to have any more than two, possibly three, concurrent clients because beyond this, managing deadlines and deliverables can become as much of a full time job as actually doing the development work. It’s here the account manager and project manager hats are suddenly required…in an agency two jobs which require full time personnel to manage. And there in lies the major pitfall of working with a freelancer – you’re at the mercy of the freelancer’s ability, discipline and professionalism. Be it through illness or simply losing interest in the project, a freelancer can disappear on you and leave you high and dry with nothing to show for the money you will ultimately have spent with them. Of course, there are plenty of services out there whereby escrow accounts and moderation teams are on hand to help with issues and I would strongly encourage anyone looking to work with a freelancer to check out Codeable. Using a service like Codeable will cost you a little more but you will have the security of your money going into escrow and Codeable’s support team being on hand to mitigate any disasters and get the project completed. As it happens, you can work with us through Codeable by clicking here. Let’s take a look at things in a snapshot. From the off, engaging a company to work for you has a lot more benefits for really only one increased negative over an employee or freelancer. That negative is cost – engaging a company will cost you more per man hour than a comparably skilled freelancer or employee. Why? Because companies have profit margins to work on and members of staff that take a salary but may have nothing to do with your particular project. With that said, let’s look at the benefits of working with an agency. Biggest benefit you’re going to experience is the structure of the agency and the efficiency that brings. Each person in the process has a role and their job is to excel at that particular role. If you were to ask for a 5 page website to built from scratch, you can expect to have 3, 4 or 5 people involved in the build. Initially, someone will work with you to build a specification and scope of work for the site and take on the role of your account manager and point of contact. This person may not actually write a line of code but they have a strong technical understanding of how a site works and their job is to extract every single detail from conversation with you to gain a comprehensive understanding of what’s required. From there, the scope of work is handed to a project manager who may simply be the lead developer on the project. The PM then assigns their team individual tasks and responsibilities, puts together a game plan to actually build the site. 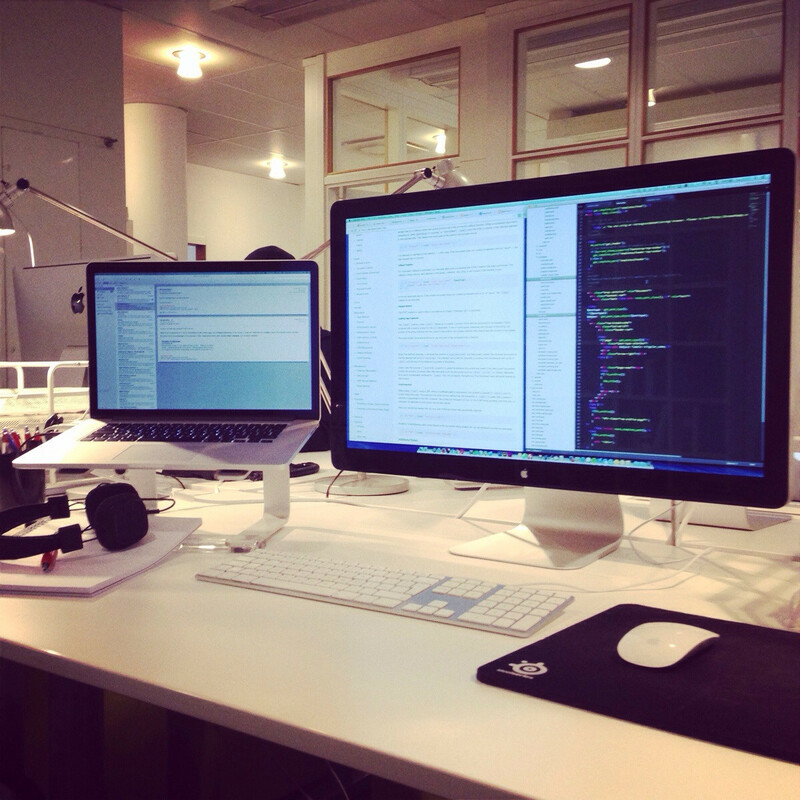 One team member will handle design exclusively but may also handle the frontend development. Rarely will you find a backend developer who can also produce exquisite designs – they simply don’t think in terms of design and are more interested in mechanics and functionality. Once frontend development is complete, a backend developer will add all the necessary functions to bring it all to life. Finally, your account manager individual will hand off the project to you. Of course, this person will have also liaised with you throughout the process, getting each stage signed off before progressing to the next. From that little scenario, we can see that at least 3 people were involved. Each member of the team involved in that scenario will have given you expert degrees of knowledge, experience and service at each stage. The downside to this structure is cost. It’s not unreasonable to assume that the company will charge at least twice as much as a freelancer asked to do the same task. But, you get experts dealing with each portion of the project and the added security having a team of people behind your project comes with. If a developer is out sick, no problem. Draft in someone who’s between projects to cover the absentee. You can sleep easy knowing that no matter who it is working on the project, they’re all at the same or similar standard and the quality of work is consistent between personnel. There’s no need to individually vet each person because it is the company’s work that speaks for all who work there. On larger projects, the benefits become even greater. If your project is of a specific size and greater, then the number of hours to build it may reach up into the hundreds. What would be preferred, one man taking 16 weeks to build something or having the whole thing built from start to finish in 8 – 12? The number of hours you’re paying for doesn’t differ. What does is the number of bodies that can be assigned to a project and thus, consume the man hour appetite of the project. Here’s a similar snapshot as before. Finally, we come on to when you shouldn’t outsource but should instead hire an employee, not necessarily on a permanent basis, but certainly full time. There are realistically very few occasions when this might be an appropriate course of action for a number of reasons. Firstly, you’ve got to have the volume of work to keep somebody busy 30+ hours per week for at least 3 – 6 months. Secondly, you’re back to the issue with hiring a freelancer – good at several things but not an expert in anything in particular. Thirdly, you yourself need to have the required skills to communicate with the developer you’ve hired. It’s not good having someone there to do the work if you don’t know how to portray to them what is you actually want them to do. There’s nothing worse than doing things a little bit at a time or with someone who hasn’t got the technical understanding as it just takes longer…a lot longer. So why not just hire the equivalent team an agency would assign to the project? Well, simply put, it’s too much hassle. Office space need acquiring, hardware purchasing and installing, employee files and records created, management structure and practices put in place. The cost to complete that simplified list is a lot and it takes time. Furthermore, how do you know if the person you’re hiring is any good? Trying to hire a team can take as long as the project itself would take to complete and is unlikely to save much if any money. Furthermore, there’s no guarantee of quality or recourse should an employee do a poor job. All you can do is fire them. But, and it’s a big one. If you have a situation where you need one set of expertise for several months on and on-going basis, then hiring an individual might just be the best thing to do. Particularly if the content of the work you do is sensitive in nature and you don’t want it zipping off across the internet to an environment you can’t control. So, what we’re looking at here is a very narrow window of specific skills required to complete the particular assignment. Database design and building perhaps, or an algorithm needs building, perhaps you’re launching a new division and need all the branding and graphical materials producing. Having an employee sat at a desk where you know where they are and you know what they’re doing is advantageous because there’s no excuse if the work isn’t delivered and you can keep an eye on what they’re doing. They’re there from 9 – 5 to do one thing and only one thing so it is going to be advantageous. Especially if it’s just one individual you require because you’re not going to incur the project management overhead you’d experience going to an agency for one individual, and they’re hourly rate will be a lot lower – especially if it’s full-time employment rather than contract based. And of course, a snapshot of the Employee option. The above is a little snapshot at each of the options available to a company or individual and doesn’t really touch on what you need to look for when hiring or explain the difficulties that face someone hiring an individual or company. Those issue will be discussed in detail in future articles. If you would like to arrange a consultation or have any questions that you feel we may be able to help answer, then please do not hesitate to get in touch. We’re here to help!